The only stand is all seater, all covered, 2000 capacity with all the latest seating and equipment the ground has only been opened for two years. The pitch is reputed to be one of the best playing surfaces in the country it is also very big! There are no known restricted views. We have a large high quality restaurant serving everything from a la carte dinners to sandwiches. The restaurant is known as Lawview Restaurant because of the excellent views of the Fife Coast and the extinct (thank heavens) volcano Largo Law. We offer a warm welcome to all visitors, to see a game, to eat in our first class restaurant, to enjoy a quiet refreshing drink or just to view the facilities on offer. There are two large car parks at the ground, one for away and one for home supporters. Each car park hold 300 cars. There is also provision for coaches in the away park. 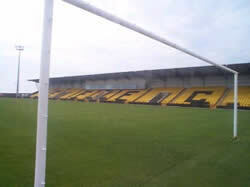 If you are a registered user then you can login, and create your own personal review of East Fife - Bayview Stadium. These reviews can be private or public.